Geofrey Diner Gallery, Washington D.C.
European furniture design of the 1980s was characterised by two extremes: on the one hand the flamboyant post-modern style of Ettore Sottsass and Milan’s Memphis group; on the other (a tightly clinched fist) the punk-inspired ‘creative salvage’ spirit of Ron Arad and Tom Dixon, who forged ahead with found or industrialised materials. Although he was a world away in Australia, Marc Newson was neither unaware nor immune from these divergent styles. In that context, his iconic ‘Lockheed Lounge’ can be read as both sleek and flamboyant while also evocative of a punk Mad Max approach to futurism. Newson’s geographical detachment from Europe permitted him to surf nimbly over the two aesthetics, creating a unique design vocabulary that was both subtly antique yet strikingly fresh. ‘If I’d been studying design in Italy, I’d have found that tradition really stifling,’ he said. ‘Coming from Australia, my design was self-taught and instinctive.’ The ‘tyranny of distance’ ironically offered Newson some respite from the torrent of 150 years of industrial design history. Nonetheless his work during these early years in Australia was not without historical departure points. Newson was born in Sydney in 1963. After a peripatetic childhood in Eastern Australia, Asia and Europe, he returned to study sculpture and jewellery design at Sydney College of the Arts. By ‘borrowing’ copies of imported Italian magazines, (Domus and Ottogano) from the newsagent where he worked part-time, he absorbed both the historical as well as the contemporary cultural currents blowing from European design studios. While his interest in the work of modern designers grew, his most visible influences during the early stage were traditional, and specifically neo-classical. As he has said of ‘Lockheed’, its ‘fluid metallic form [was] loosely, very loosely’ based on the chaise lounge he’d seen in reproductions of Jacques-Louis David’s neo-classical portrait of Madame Récamier. David’s painting of 1800, with its evocative imagery that poignantly interweaves the themes of seduction, death and laughter, has been cited as an important influence on the development and popularisation of the chaise longue in the early 19th century. In her role as salonnière to the city's political and cultural elite, Jeanne-Françoise Julie Adélaïde Récamier was regarded as the toast of post-Revolutionary Paris. When first unveiled, David’s portrait sparked an interest that swept across the Continent. During the Empire period, the social codes attached to parlour etiquette and the more precisely defined role of women as arbiters of morals and manners, excluded them from reclining in ‘polite society’ and ensured that they used reclining chairs only in private quarters. As a visual signifier the chaise longue was, with David’s scenographic brushstroke, imbued with notions of privacy, seduction and, in Récamier’s case, entrée into a highly sophisticated and desirable inner sanctum. Newson’s ‘Lockheed’ loses none of this frisson. Sculpted from a foam surfboard blank, then cast in fibreglass, the surface is sheathed in hand-hammered, thin-walled aluminium sheets fixed with blind rivets. While austere in its casing, its curvaceous form is undeniably sensual and provocative (a quality that earned the ‘Lockheed’ a starring role in Madonna’s 1993 Rain video). Yet it’s because of its formal rigor that Newson’s chair truly takes flight. Named after the American aircraft manufacturer, ‘Lockheed Lounge’s riveted body is a palpable metaphor for an airplane fuselage. It’s also an acknowledgement of Newson’s lifelong fascination with aviation (he is currently Creative Director of Qantas), and suggests a nostalgic yearning for the optimistic era of post-war aircraft technology. Through its labour-intensive and artisanal production, ‘Lockheed Lounge’ reveals an inherent understanding of the relationship between the human body and an object. Newson’s sculptural sensibility, informed by his training as a jeweller, has drawn parallels between ‘Lockheed’ and Alexander Archipenko’s aluminium bolide ‘Torso in Space’ of 1936. Writing of his own work the Ukrainian-born Archipenko noted, ‘Reflection enriches the effect of the object… it can amplify or reduce the effect of forms, colours or line; it can transform shadow according to the positions of the planes or the concave or convex bending of the reflecting metal. Reflections express depth and space; they absorb the entire environment to which they are exposed...’ As one of the most discussed and coveted design objects of the last few decades, the ‘Lockheed’ absorbs, amplifies and reflects the environment from which its futuristic sensuality emerged. It was the break-through piece that established, very early in his career, Newson’s approach to design as an ‘experimental exercise’ in extreme structure combined with a tactile and rigorous exploration of materials, processes and skills. It encapsulated his distinctive position outside any existing aesthetic movement while drawing on varied sources including neo-classicism, biomorphism, the space race and surf culture. 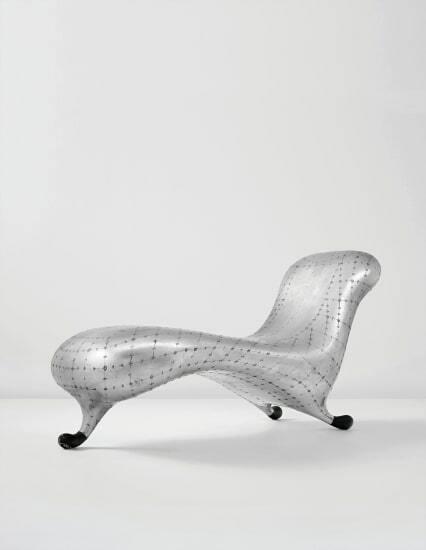 ‘Lockheed Lounge’ is included in the permanent collections of key museums including the Vitra Design Museum, Weil am Rhein, and the Powerhouse Museum, Sydney, as well as important private collections. In 2000 the chair was the focus of the Carnegie Art Museum's Aluminium exhibition. It was the opening act of Newson’s first major European retrospective staged at the Groninger Museum, Holland in mid-2004 and subsequently at London's Design Museum. That it remains a constant in cultural and academic dialogue twenty-two years after its shimmering form evolved, ‘Lockheed Lounge’ is a defining object in the vocabulary of 21st-century aesthetics. The present lot will be included as 'MN – 14LLB – 1988' in the forthcoming catalogue raisonné of limited editions by Marc Newson being prepared by Didier Krzentowski of Galerie kreo, Paris. Fibreglass-reinforced polyester resin core, blind-riveted sheet aluminium, rubber-coated polyester resin. Handmade by Marc Newson at Basecraft for Pod, Australia. Number 10 from the edition of 10 plus 4 artist’s proofs and 1 prototype. Underside impressed with BASECRAFT SYDNEY. Together with a certificate of authenticity signed by the artist. Monumental ‘Embassy’ chandelier, designed for the living room of the Danish Ambassador’s Residence, Washington, D.C.